Linksys Official Support - How do I find my model and serial number? How do I find my model and serial number? Troubleshooting often requires you to know your device’s model, version, and serial number. Aside from the device itself, the serial number of your Linksys device is also printed on the box. Select a product category below to know how to find the model and the serial number of your Linksys device. NOTE: Depending on the model number, your product may look different from the examples provided below. You can find the model and serial number below the Linksys logo. If there is no version number beside the model number, this means it is version 1. Look at the top of the device. You can find the model number below or next to the Linksys logo. If there is no version number beside the model number, this means it is version 1. In the example below, the model number of the device is E3200. NOTE: The serial number is located on the sticker underneath the device. For EA9200, you can find the model number on the sticker underneath the vertical stand. You can find the model and serial number on the sticker underneath the device. If there is no version number beside the model number, this means it is version 1. In the example below, the model number of the device is WRT54G ver.6. 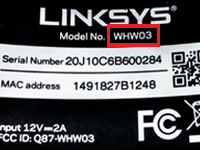 NOTE: For WRT1900AC, the model number is located on the front panel, below the Linksys logo. Look at the back panel of the router when it is standing vertically. You can find the model and serial number on the sticker at the back. If there is no version number beside the model number, this means it is version 1. In the example below, the model number of the device is WRT54GX4. You can find the model and serial number on the sticker at the back. If there is no version number beside the model number, this means it is version 1. In the example below, the model number is WRTP54G V.2. You can find the model and serial number on the sticker at the back. If there is no version number beside the model number, this means it is version 1. In the example below, the model number is WRV54G. Look at the front panel. You can find the model number below the Linksys logo. If there is no version number beside the model number, this means it is version 1. In the example below, the model number is WAP610N. NOTE: The serial number is located on the sticker underneath or at the back of the device. For older Linksys wireless access points, you can find the model number underneath the device. You can find the model number below the Linksys logo. If there is no version number beside the model number, this means it is version 1. In the example below, the model number is RE3000W. NOTE: The serial number is located on the sticker underneath the device. For older Linksys wireless range extenders or expanders, you can find the model number underneath the device. If your adapter is connected to the computer, shut down your computer and remove the adapter. You can find the model and serial number on the device itself. If there is no version number beside the model number, this means it is version 1. In the example below, the model number is WPC54G ver. 7. You can find the model and serial number on the device itself. If there is no version number beside the model number, this means it is version 1. You can find the model and serial number on the sticker underneath or at the back of the device. If there is no version number beside the model number, this means it is version 1. In the example below, the model number is AE6000. Look at the back panel of the device. You can find the model and serial number on the sticker at the back. If there is no version number beside the model number, this means it is version 1. In the example below, the model number is WVC54GC. You can find the model and serial number on the sticker underneath the device. If there is no version number beside the model number, this means it is version 1. In the example below, the model number of the device is BEFSR41 ver.4.1. You can find the model and serial number on a sticker on the device. If there is no version number beside the model number, this means it is version 1. In the example below, the model number is LNE100TX VERSION 4.1. You can find the model number under the Linksys logo, on the upper-left side. If there is no version number beside the model number, this means it is version 1. In the example below, the model number of the device is SE3024. NOTE: The serial number is located at the back of your device. For SE4008, you can find the model number underneath the device. You can find the model number below or next to the logo. If there is no version number beside the model number, this means it is version 1. In the example below, the model number of the device is SE1500. NOTE: The serial number is located underneath the device. You can find the model number below the Linksys logo. If there is no version number beside the model number, this means it is version 1. In the example below, the model number of the device is WUMC710. 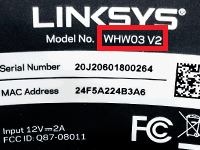 NOTE: For older Linksys wireless bridges, you can find the model number underneath the device. You can find the model and serial number on the sticker underneath the device. If there is no version number beside the model number, this means it is version 1. In the example below, the model number is NMH410. You can find the model and serial number on the sticker underneath the device. If there is no version number beside the model number, this means it is version 1. In the example below, the model number of the device is DMC250.